"Yes, Virginia, there is a Santa Claus" is a phrase from an editorial called Is There a Santa Claus?. The editorial appeared in the September 21, 1897, edition of The (New York) Sun and has since become part of popular Christmas folklore in the United States. It is the most reprinted editorial in any English-language newspaper. Church was a war correspondent during the American Civil War, a time that saw great suffering and a corresponding lack of hope and faith in much of society. Although the paper ran the editorial in the seventh place on the page, below even one on the newly invented "chainless bicycle", it was both noticed and well received by readers. More than a century later it is the most reprinted editorial in any newspaper in the English language. In 1971, after seeing Virginia's obituary in The New York Times, four friends formed a company called Elizabeth Press and published a children's book titled Yes, Virginia that illustrated the editorial and included a brief history of the main characters. Its creators took it to Warner Brothers who eventually made an Emmy award-winning television show based on the editorial. The History Channel, in a special that aired on February 21, 2001, noted that Virginia gave the original letter to a granddaughter, who pasted it in a scrapbook. It was feared that the letter was destroyed in a house fire, but 30 years later, it was discovered intact. A copy of the letter, hand-written by Virginia and believed to be the original by her family was authenticated in 1998 by Kathleen Guzman, an appraiser on the television program Antiques Roadshow. 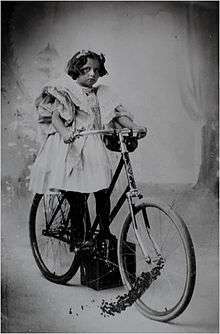 Some commentators doubt that a young girl would refer to children her own age as "my little friends" and suspect Virginia's father may have assisted her in composing the letter or even wrote it himself. The story of Virginia's inquiry and The Sun's response was adapted in 1932 into an NBC produced cantata (the only known editorial set to classical music), a segment of the short film Santa Claus Story (1945), and an Emmy Award-winning animated television special aired in 1974 on ABC, animated by Bill Meléndez (who had worked on various Peanuts specials). In 1991 it was adapted into a made-for-TV movie starring Richard Thomas and Charles Bronson. In 1996, the story was adapted into an eponymous holiday musical by David Kirchenbaum (music and lyrics) and Myles McDonnel (book). The last two paragraphs of Church's editorial are read by actor Sam Elliot in the 1989 film Prancer, about Jessica Riggs, a little girl who believes the wounded reindeer she is nursing back to health belongs to Santa. Jessica's story inspires the local newspaper editor, as Virginia's letter did to Church, to write an editorial which he titles Yes, Santa, there is a Virginia. In 2003 "Yes, Virginia, there is a Santa Claus" was depicted in a mechanical holiday window display at the Lord & Taylor department store on Fifth Avenue in Manhattan. In 2009, The Studio School in New York City, honored Virginia's life and legacy. Janet C. Rotter, Head of School, announced the establishment of the Virginia O'Hanlon Scholarship, speaking passionately about their commitment to offering need-based scholarships for students of merit. Virginia's descendants continue her legacy. In December 2015, Macy's department store in Herald Square, New York City, NY used Virginia's story for their holiday window display. Illustrated in three-dimensional figurines and spanning several windows on the south side of the store along 34th Street between 6th and 7th Avenues. This version of "Yes, Virginia" is based on the 2010 television special of the same name, starring Neil Patrick Harris and Bea Miller. Laura Virginia O'Hanlon was born on July 20, 1889, in Manhattan, New York. Her marriage to Edward Douglas in the 1910s was brief, and ended with him deserting her shortly before their daughter, Laura, was born. She was listed as divorced in the 1930 United States Census but nevertheless kept her ex-husband's surname the rest of her life, styled as "Laura Virginia O'Hanlon Douglas." Virginia received her Bachelor of Arts from Hunter College in 1910, a master's degree in education from Columbia University in 1912, and a doctorate from Fordham University in 1930. The title of her dissertation was "The Importance of Play". She was a school teacher in the New York City ISD. She started her career as an educator in 1912, became a junior principal in 1935, and retired in 1959. Virginia received a steady stream of mail about her letter throughout her life. She would include a copy of the editorial in her replies. In an interview later in life, she credited it with shaping the direction of her life quite positively. In December 2012, radio station WGNA-FM in Albany, NY  published a photo of Virginia meeting Santa on Christmas Eve 1969, two years before her death. Virginia died on May 13, 1971 at the age of 81, in a nursing home in Valatie, New York. She is buried at the Chatham Rural Cemetery in North Chatham, New York. 1 2 3 Campbell, W. Joseph (Spring 2005). "The grudging emergence of American journalism's classic editorial: New details about 'Is There A Santa Claus?'". American Journalism Review. University of Maryland, College Park: Philip Merrill College of Journalism. 22 (2). Retrieved 2007-10-29. 1 2 3 "1897 "Yes, Virginia" Santa Claus Letter". Antiques Roadshow. Public Broadcasting Service. July 19, 1997. ↑ Quoted from Virginia's original letter text. ↑ Rooney, Andy (2007). Common Nonsense. New York: PublicAffairs. ↑ "Yule Log Ceremony". Barnard Campus News. Barnard and Columbia holiday events. Barnard College, New York City. 2001-12-04. Archived from the original on Feb 22, 2002. Retrieved 2007-11-13. During the Yule Log ceremony, the passing of the seasons is marked by the reading of... the famous editorial on the true spirit of Christmas, "Yes, Virginia, There Is A Santa Claus"
1 2 'Yes, Virginia, There is a Santa Claus.'. (2000). 'The World Encyclopedia of Christmas'. 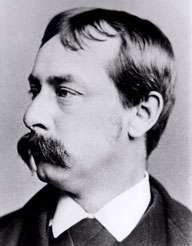 Gerry Bowler, Editor. Toronto: McClelland & Stewart Limited. pp. 252–253. ↑ "Yes, Virginia, There Is a Santa Claus (TV 1974)". IMDb.com. Retrieved 2011-01-28. ↑ "Yes Virginia, There Is a Santa Claus (TV 1991)". IMDb.com. Retrieved 2011-01-28. ↑ Ebert, Roger (17 November 1989). "Prancer Movie Review & Film Summary". rogerebert.com. Ebert Digital LLC. Retrieved 7 December 2015. ↑ Vincigueera, Thomas (1997-09-21). "Yes, Virginia, a Thousand Times Yes". query.nytimes.com. The New York Times. Retrieved 2010-12-27. ↑ "Christmas in New York: Lord and Taylor Christmas Holiday Window displays 2003 Photo Gallery". Gonyc.about.com. 2009-11-02. Retrieved 2010-03-01. ↑ Haberman, Clyde (2004-12-24). "NYC - Yes, New York, There Was A Virginia". query.nytimes.com. The New York Times. Retrieved 2010-12-27. 1 2 Fernandez, Manny (2010-12-24). "To Virginia's Family, Santa Claus Is Still Real". The New York Times. pp. A23,A29. ISSN 0362-4331. Retrieved 2010-12-27. ↑ ""Yes, Virginia…", by Joanne, 20 Dec 2010". About English Idioms. 2010-12-10. Retrieved 2011-01-08. ↑ V., Douglas, Laura (1930-01-01). The Importance of Play (Thesis). Fordham University. ↑ "Virginia, Now 70, Quits As Teacher; School Principal Who at 8 Asked 'Is There a Santa?' Is a Guest at Dinner" (Abstract of subscription PDF). The New York Times. 1959-06-12. Retrieved 2007-10-29. Mrs. Laura Virginia Douglas, retiring after forty-three years as a public school teacher and principal, was given a farewell dinner by her colleagues last night at the Towers Hotel in Brooklyn. ↑ "Yes, Virginia, There Is a Santa Claus". WNYC. December 8, 2010. Retrieved October 24, 2016. 1 2 "Yes Virginia — 66 years later". Canadian Broadcasting Corporation. Dec 24, 1963. Archived from the original on June 5, 2008. Retrieved 2010-03-01. ↑ "Virginia of "Yes, Virginia, There is a Santa Claus" reads her famous letter". WTEN. December 24, 2009. Retrieved October 24, 2016. ↑ Morrison, Jim "Santa Junior"; McElhany, Jennifer. "Yes, Virginia, there is a Santa Claus". National Christmas Centre, Exhibits. National Christmas Centre. Archived from the original on Dec 27, 2011. Retrieved 2007-11-13. Throughout her life she received a steady stream of mail about the letter, and to each reply she attached an attractive printed copy of the editorial. 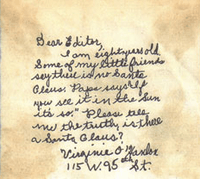 ↑ "Decades Later, Santa Claus Visits Author of Iconic 'Yes Virginia' Letter". Townsquare Media. 2012-12-11. Retrieved Dec 25, 2013. ↑ "Virginia O'Hanlon, Santa's Friend, Dies; Virginia O'Hanlon Dead at 81" (Abstract of subscription pdf). The New York Times. 1971-05-14. Retrieved 2007-10-29. Valatie, N. Y., May 13 – Virginia O'Hanlon Douglas, who as a child was reassured that "Yes, Virginia, there is a Santa Claus", died today at the age of 81. ↑ "Virginia O'Hanlon - Chatham Rural Cemetery". Find A Grave. Retrieved 2011-02-14. Thomas Vinciguerra (1997-09-21). "Yes, Virginia, A Thousand Times Yes". The Week in Review. The New York Times.